This charming, full-color field guide to 25 birds easily found in Berkeley proves that even the city’s avian residents are a little quirky. Meticulously detailed illustrations capture each bird’s distinctive physicality and temperament. A Burrowing Owl faces you in a full-on head shot, perhaps having just raised its raspy, chattering alarm call as you trespass on its last remaining Bay Area foothold at the Marina. The Anna’s Hummingbird gives you a coy backward glance to assess if you’ve properly admired its flashy throat feathers, maybe having just performed its signature J-shaped courtship dive. Even in composition, each bird is strikingly individual, whether depicted in mid-dive or creeping into frame. While descriptions of identification and vocalizations are straightforward, author-illustrator Oliver James takes a delightfully creative approach to his write-ups of each species. 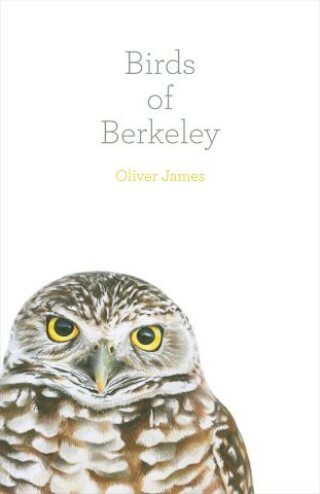 He invites you to imagine that a Cooper’s Hawk, for example, is Steve McQueen in a ’68 Mustang, and you, “a pigeon in a rental car with a poor turning radius,” are fleeing through traffic: “It’s all over in a matter of seconds.” A joy to read and pore over, Birds of Berkeley will enchant readers far beyond the city limits with its findings gleaned from painstaking and patient wildlife observation.